Aflac may have a tremendous track record of success, but no company is without risk. Here are three reasons Aflac's stock could fall. Over the decades Aflac (NYSE:AFL) has earned a laundry list of superlatives: One of the world's most ethical companies, best companies to work for, most admired companies, and dividend aristocrat -- but no company is bullet proof. However, I believe there are three reasons Aflac's stock price could fall in the months and years ahead. First, with roughly 75% of revenue coming from Aflac's operations in Japan, the company is exposed to severe currency risk. Second, population decline in Japan could shrink Aflac's most profitable market. Thirdly, deregulation has increased competition, and could steal market share from Aflac in the future. Economic policy in Japan -- or, anywhere in the world -- works like a Rube Goldberg machine, with all sorts of levers and ball bearings manipulated by the country's central bank. In this case, however, part of the plan has been to intentionally devalue the Japanese yen to boost international trade -- something that worked well in the 1980s but hasn't been as successful recently. 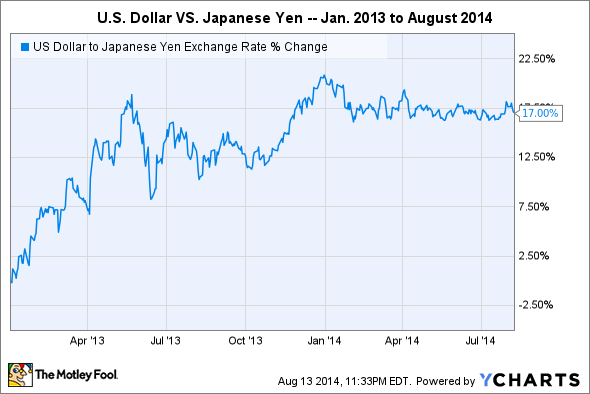 Currently one U.S. dollar is worth about 102 Japanese yen -- and that number is up 17% since January of 2013. Aflac's second quarter filings suggested that because the majority of business operations are conducted in Japan, their "functional currency is the Japanese yen, [and] fluctuations in the yen/dollar exchange rate can have a significant effect on our reported results." The key word is "reported." Aflac doesn't revert yen into dollars every quarter, and changes in currency have no impact on the strength of the underlying company. However, quarter-to-quarter earnings growth is extremely important to many investors, and further declines in the yen versus the dollar could cause declines in Aflac's stock price. Japan made headlines in 2013 when the country's population dropped by almost 250,000. According to BBC Asia, if the trend were to continue Japan would lose a third of its population over the next 50 years. Also, at roughly 30%, Japan has one of the highest percentage of individuals 65 and older in the world -- and that number is growing. In the short-term, the aging population could benefit Aflac as people look for greater coverage beyond the state-run health care system -- but as the population and number of retirees grows the workforce shrinks, which could potentially strain Japan's economy while reducing Aflac's pool of potential customers. In 1974, Aflac became the third U.S company licensed to sell insurance in Japan. This gave Aflac a huge leg up to establish its brand in a less competitive market for supplemental insurance. However, as part of the plan to improve economic growth Japan's government has been deregulating, and allowing more foreign companies to compete. Today, massive global insurers like ING, Prudential Group, and Metlife are all competing for market share in Aflac's key market, "critical illness insurance." While Aflac still holds a dominant market share in the region, mix a shrinking population with greater competition and sales growth could get more difficult looking forward. No business is free of risk, and Aflac certainly has its fair share. That said, I still believe that the long-term value fluctuations of the yen will have little impact on Aflac's core business. And whether it's through an increased birth rate or loosening restrictions on immigration, Japan will find a way to grow its population over time, and the company's brand name recognition and alliance with conglomerate Japan post will help Aflac ward off competitors. For these reasons, I find Aflac a great business and a strong buy for any portfolio.